Former leader of a splinter group of war veterans, Mr George Mlala, is allegedly on the run after police discovered seven tonnes of rice stashed at his house in Bulawayo. The rice, among other things, was allegedly found at his residential Flat Number 6, Trust Building at the Corner of 14 Avenue and Joshua Mqabuko Street in the city centre. Police reportedly launched a manhunt after he could not be located to account for the grain. Bulawayo police spokesperson Inspector Precious Simango confirmed that Mr Mlala was on the police wanted list. “As police, we are hunting for George Mlala after 159x50kgs of rice was found in his house. The rice amounts to about 7,8 tonnes. It was discovered following a police raid at his house in the city centre. Mlala has not been seen so that he could explain where he got the huge quantity of rice,” said Insp Simango. She said those who may have information on the whereabouts of Mr Mlala should report to the nearest police station. “Those who may have information that may lead to the location of Mr Mlala may come forward. Alternatively, they can get in touch with the Officer-in-Charge CID Law and Order, Bulawayo, Detective Inspector Musona or the investigating officer Detective Inspector Mpofu on (09) 64232 or any nearest police station,” she said. It is not the first time for Mr Mlala to be fingered in allegations of corruption. 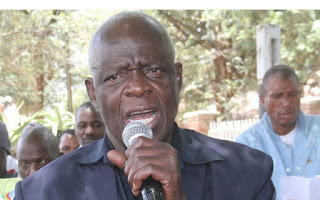 Last year, former War Veterans Minister Retired Colonel Tshinga Dube accused Mr Mlala of soliciting for bribes from the city business people using the ruling party, Zanu-PF’s name. Rtd Col Dube said Mr Mlala had imposed himself as Zanu-PF Bulawayo provincial secretary for security and used that position to solicit for bribes while externalising money. Mr Mlala vanished from the public scene following Zimbabwe Defence Forces Operation Restore Legacy last November. He briefly appeared at Plumtree Border Post last month where he was observed hiding in a car in which former Vice President Phelekezela Mphoko and his family were travelling. He joins several Zanu-PF members who are allegedly being investigated by the Government for corruption. President Mnangagwa has promised that his Government will fight corruption and already some former ministers have appeared in court for abuse of office. Some of the notable arrests include former Finance Minister Ignatius Chombo, former Minister of Mines, Walter Chidhakwa, and Midlands provincial minister Jason Machaya.